"Chinito" is probably the best Grand Banks 32 ever offered for sale. 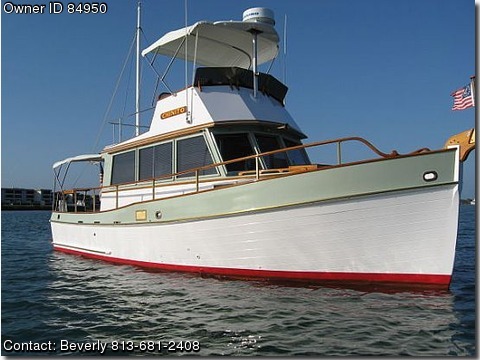 It is for sale by the original owner of 38 years and was purchased new in March 1971 at the Miami Boat Show. The boat is a museum piece in bristol condition. The decks, super structure, hull and bottom, have been professionally painted every 1 to 1 1/2 years since new. "Chinito" looks like a fiberglass boat. Terry Burton Custom Crafts, Inc. has done the wood work on the boat for the past 26yrs. Terry is now retired and this is the only boat he still works on. The boat from the cap rail up has just been refinished in July 2008 including varnish, teak deck treated with Sikkens and superstructure painted.Deember 2008 boat has just completly been repainted from the cap rail down including bottom paint. The forward cabin has a v-berth with a custom made filler to make a large berth, aft to port is a hanging locker with 2 custom made L-shaped shelves for lots of storage. Across to starboard is the head w/shower and pressure water. There is hidden rope lighting throughout the forward cabin and head allowing for night lighting the area witout disturbing your partner when getting up in the middle of the night. Up the steps to starboard is a the helm station across to port is the galley. Aft of the galley is the port settee that converts into an over under bunk, across to starboard is the dinette where the table lowers to become a double and allows the boat to sleep a total of (6). There are mini blinds thru-out the salon and has exterior UV sun screens over all windows. Lots of storage thru-out the boat. Many extra drawers have been added. The forward cabin has added African Fiddle Back Anagrey veneers to where formica used to be. The grain in this wood is beautiful. The dinette tabletop is burled book matched maple. The chart plotter and duplicate instrunments are up on the bridge and rest below. Village Marine 22 gph water maker (in-op) but may only need new membrane?? Large engine room with great access to the generator and engine, Westerbeke 8kw generator 2904 hrs. Complete Canvas cover for the boat which extends to just below the rub rail. Note: Terry Burton has maintained this vessel for 26 years. He is one of the best craftsman in the industry. The is "No Rot" in this boat and never has been. Yacht Power Products of St Petersburg, Florida has done the mechanical mainanence for many years on a regular basis. Until very recentlt the boat has always been kept in a covered slip. That marina closed and the full boat cover was made for the boat to protect it against the sun. There is a recent out of the water survey available (3-4 yrs old). The boat was cunstructed in Jurong, Singapore in 1969 and shipped to the states. It was in the February 1971 Boat show (probably a 1970 model)and was sold to the present and original owner in March of 1971. You have to see this boat!! Completely rewired boat with BRAND NEW Paneltronics AC/DC panels which have been installed on a hinge allowing for extremely easy access. New Raymarine autopilot, Raymarine Smart Pilot with dual controls interfaced with chartplotter GPS. New bimini on Flybridge and Aft Cabin. Covers for hand rails (upper and lower), Westmarine VHF, Westmarine on the bridge with Depthrecorder.